With the threat of multidrug-resistant bacterial pathogens growing, new ideas to treat infections are sorely needed. Researchers at University of California, San Diego School of Medicine and Skaggs School of Pharmacy and Pharmaceutical Sciences report preliminary success testing an entirely novel approach — tagging bacteria with a molecular “homing beacon” that attracts pre-existing antibodies to attack the pathogens. The study is published by the Journal of Molecular Medicine. The molecular homing beacon is the brainchild of study co-author and Nobel Laureate Kary Mullis, PhD, who invented polymerase chain reaction (PCR), a now-common lab technique used to replicate DNA. One end of the homing beacon is made up of a DNA aptamer, a small piece of DNA that can be selected from a pool of billions of candidates based on its ability to bind tightly to a particular target. In this test case, the aptamer specifically targeted group A Streptococcus, the bacteria that causes strep throat and invasive skin infections, while leaving human cells untouched. The other end of the homing beacon is alpha-Gal, a type of sugar molecule. 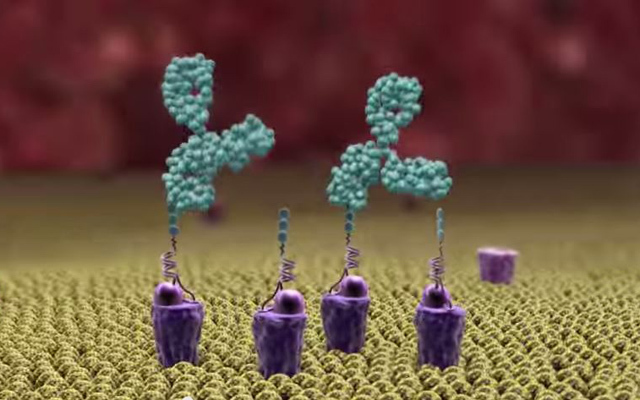 Humans naturally produce antibodies against alpha-Gal. That’s because alpha-Gal is foreign to humans. Other mammals and some microbes produce it. Humans have evolved antibodies against it when we eat meat or are exposed to alpha-Gal-generating microbes in our environment. To test the homing beacon — or “Alphamer” — against live strep bacteria, Mullis enlisted the help of Victor Nizet, MD, professor of pediatrics and pharmacy at UC San Diego, whose laboratory studies how pathogens interact with the human immune system. The research team found that Alphamers not only bind strep and recruit anti-Gal antibodies to the bacterial surface, they also helps human immune cells engulf and kill the Alphamer-coated bacteria. The study offers the first proof-of-concept that Alphamers have the potential to specifically redirect pre-existing antibodies to bacteria and rapidly activate an antibacterial immune response. If Alphamers continue to show promise, researchers might be able to apply the same concept to attack any type of bacteria or virus, or perhaps even cancer cells. Co-authors of this study include John H. Hwang, and Emma Leire, UC San Diego; Bradley Hall, and Kary B. Mullis, Altermune Technologies; John Iacomini, Tufts University School of Medicine; Robert Old, Loxbridge Research; Uri Galili, University of Massachusetts Medical School; Charles Roberts, and Mike Westby, Altermune Technologies and Loxbridge Research. This research was funded by Altermune Technologies, LLC (Irvine, CA). Disclosure: Victor Nizet is a member of the Scientific Advisory Board for Altermune Technologies, LLC.